Will 3D hit the big time in 2012? We'll be jetting off to MWC 2012 this weekend to get all the latest from the big players in the mobile phone world. A whole raft of new handsets are lined up and ready to strut their stuff down the catwalk in Barcelona, flaunting the latest tech (expect to see quad-core processors, NFC, HD screens and 4G/LTE) in an attempt to be the big phone of 2012. With so many possible new handsets we've pulled together the 10 we are most excited about getting hands on with. Although not officially confirmed, the HTC One X looks almost certain to make an appearance at MWC 2012 after months of rumours surrounding the phone. Originally rumoured as the Edge and then Endeavor, the HTC One X signals the arrival of quad-core handsets with the Nvidia Tegra 3 processor sporting four (or is it five?) 1.5GHz chips. The One X looks set to also pack 1GB of RAM and 32GB of internal storage but oddly no microSD card slot to expand storage with - bummer. Android 4.0 deliciously known as Ice Cream Sandwich is set to feature heavily at MWC 2012 and the HTC One X is expected to run version 4.0.5 along with HTC's new Sense 4.0 overlay. The One X screen is likely to be a 4.7-inch 720p HD display and it's been suggested it will be "a next-generation 'optically-laminated' 720p display" – we've no idea what this means, but we defintely want to check it out! That aside, we expect the One X to pump out luscious graphics and stunning video playback. Also set to feature on the HTC One X is an 8MP rear facing camera with LED flash and the ability to capture full HD (1080p) video, a front-facing 1.3MP snapper and stereo microphones for improved audio quality. We will put the One X through its paces and seeing how quick it really is – will there be a noticeable difference between it and the likes of the dual-core iPhone 4S and Samsung Galaxy S2? LG is jumping on the quad-core bandwagon and has officially announced the Optimus 4X HD ahead of the handset's MWC appearance. We reckon the rumoured LG X3 has become the Optimus 4X HD, but minus the reported NFC technology and 4G capabilities. The Optimus 4X HD will come with Nvidia's 1.5GHz quad-core Tegra 3 chipset and will run Android Ice Cream Sandwich. 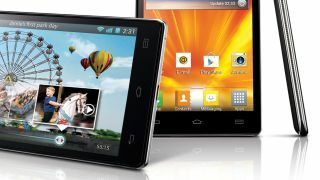 The LG Optimus 4X HD will house a big 4.7-inch True HD IPS (720p) screen, 8MP rear-facing camera with LED flash and 1.3MP front facing camera in a body which is just 8.9mm thin – pretty impressive. You'll also find 16GB of internal storage and a 2,150mAh battery, which may not keep those quad-cores running for long. Rounding off a quad-core trio is Huawei Ascend D1 Q which will go head to head with the HTC One X and LG Optimux 4X HD. Huawei is still one of the new kids on the mobile phone block but has set its sights high in challenging the more established manufacturers out there. The Ascend D1 Q was announced by Huawei's chairman on his social network profile and Huawei says the Ascend D1 Q is its "smartest and fastest" phone yet. Huawei has not officially confirmed the Ascend D1 Q will come packing a quad-core processor, but as its predecessor the Ascend P1 S runs a 1.5GHz dual-core chip it looks like the four core setup is most likely. Details for the Ascend D1 Q are thin on the ground, but Huawei has recently released some preview images, showing off a sleek and slender handset. Here at TechRadar we're still on the fence when it comes to 3D phones; sure it's a cool feature but is it really needed? There's no doubt in LG's mind however, as it confirmed that it will launch its second glasses-free 3D handset in the form of the LG Optimus 3D Max at MWC 2012. The Optimus 3D Max builds on the original Optimus 3D delivering a richer 3D experience and an enhanced 3D converter which will allow you to view those boring 2D apps in the magical third dimension. The Optimus 3D Max will have a 4.3-inch (480x800) screen and a dual-core processor which has been bumped up to 1.2GHz, backed up with 1GB of RAM. LG has also added NFC technology allowing you to use the new LG Tag+ functionality. LG has put its 3D hardware on a diet and has managed to squeeze it into a 9.6mm deep handset weighing in at 148g, 2.3mm thinner and 20g lighter than the original. Disappointingly though the Optimus 3D Max will not ship with Ice Cream Sandwich – with users having to make do with Android 2.3 Gingerbread, but LG has promised an ICS update will be available "shortly after the launch". Having spent some time with the Optimus 3D in the past we are keen to see how LG has improved the display and how well the converter works. Look out for our hands on: LG Optimus 3D Max review for the full 3D run down. After buying Ericsson out of the Sony Ericsson dual-venture, Sony is now re-focussing it mobile phone sector and preparing a fresh onslaught into the market for 2012. We have already seen the Xperia S break cover at CES 2012 and Sony looks to continue the revival with its Xperia P handset. Originally leaked as the Xperia Nypon and looking rather similar to the Xperia Arc S, new rumours revealed the likely launch name Xperia P last month. The Xperia P looks set to slide into the mid-range handset market as leaked specs point towards a 1GHz dual-core core processor, 4-inch qHD screen, Android operating system and an 8MP camera. Thanks to a Sony handset roadmap (yet another leak in the Sony handset saga) the Xperia P is ear-marked to hit stores in April with a price tag of around £300. Sony is also expected to launch the Xperia U (Kumquat) in Barcelona, so keep a look out for our hands on reviews for both handsets.